Using Amazon route53 has a huge advantage that it offers a TTL of as low as 60 seconds. This means changing IP for your domain can be as fast as 60 seconds everywhere (assuming every DNS server honours TTL value). Here are steps to use route53 as your domain name server (DNS) for a domain registered somewhere else. Note that you don’t need to transfer registrar for this. 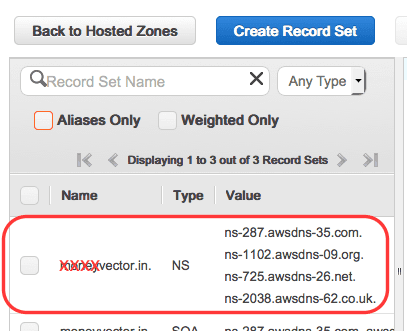 Go to Amazon route53 console and click on create hosted zone. Enter your domain name and click on create button. Previous will create few NS servers for your domain. Make a note of these. These needs to be updated at domain admin interface provided by your domain registrar. Now we’ll create a new record set for your domain. We’ll create one A level record for top level domain. 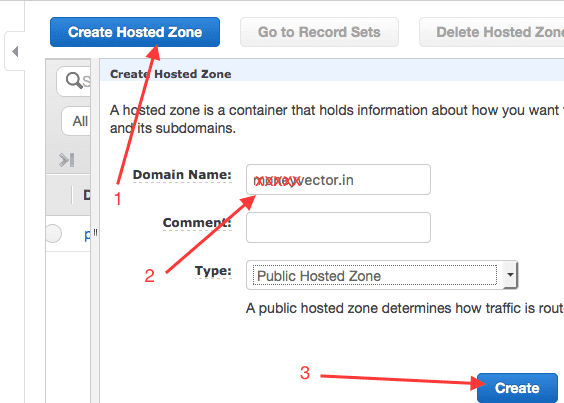 You can create more A records for subdomain and/or cnames if required. Crate name part empty for top level domain. 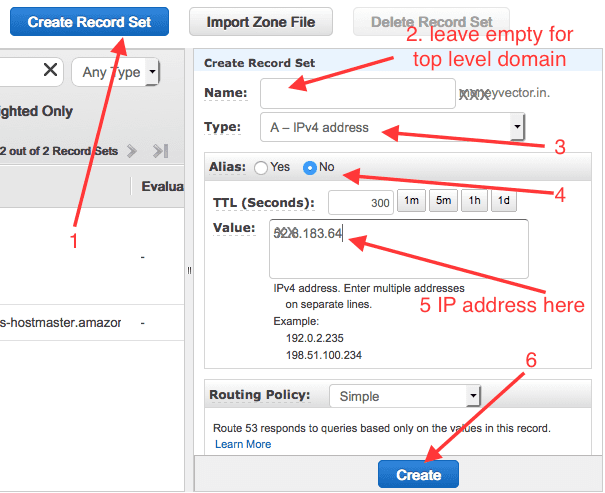 Select type A IPv4 (unless you are creating IPv6 entry) and enter IP address value. Alias should be “No” and leave TTL to default value. Once everything is done, click create. [Optional] To validate if entry is created in Amazon name servers, query one of the name servers noted above using dig. Please note that these name servers not yet registered at registrar’s end. That is why we are querying by specifying a specific name server. Goto the domain admin interface provided by your registrar and replace the default name servers with the name servers from route53 interface we noted above. Once done, you can validate by querying the name servers of your domain using dig. yourdomain.com. 21599	IN	NS	ns-287.awsdns-35.com. yourdomain.com. 21599	IN	NS	ns-1102.awsdns-09.org. yourdomain.com. 21599	IN	NS	ns-725.awsdns-26.net. yourdomain.com. 21599	IN	NS	ns-2038.awsdns-62.co.uk.